ELLENVILLE, N.Y. - A day of routine training to employ water buckets with military helicopters turned into a real-world firefighting mission for two New York Army National Guard UH-60 crews on Tuesday. The 10 Soldiers, based at Albany International Airport, planned to practice the use of water buckets by picking up water from a Saratoga County lake and dropping it again. Instead, the pilots and crews were rerouted south to Sullivan and Ulster Counties where a wildfire was consuming more than 2,200 acres of Shawangunk Ridge State Forest. They trained by dropping water on fires, not into the lake. By the end of the day, the Army National Guard aviators had flown 13 hours and dropped some 60 water bucket loads onto the fire putting 660 gallons on the fire each time. The fire started Sunday, May 3, and rapidly spread through the evening. Some 30 homes were evacuated as a precaution Monday, May 4, and then allowed home again Tuesday as additional firefighting resources were brought to bear. The pilots and crews joined the efforts of two New York State Police UH-1 “Huey” helicopters to create a sustained effort to douse water on the edge of the fire, drawing from the state park’s Lake Maratanza. Burns was the lead coordinator for the aerial firefighting effort. The National Guard aircrews bring tremendous capability to contain the fire, said Capt. Steve Scherry of the NYS Department of Environment Conservation. Additional firefighters from Orange, Greene, Schoharie, Delaware and Broome counties arrived earlier to sustain the ground effort to make fire breaks or employ controlled burns to rob the wildfire of fuel and limit its spread. Within an hour of arrival, the National Guard and State Police aircrews had coordinated their plan of attack with the forest rangers and firefighters to bring some 2,000 gallons of water onto the wildfire with each cycle. The challenges for the training are greater than the airspace coordination and communication challenges of working with so many first responders. The flight conditions for operating the Bambi buckets, their trademark name, create unique demands on the entire aircrew, said Chief Warrant Officer 5 Charles Rodda, the ground liaison officer for the mission. 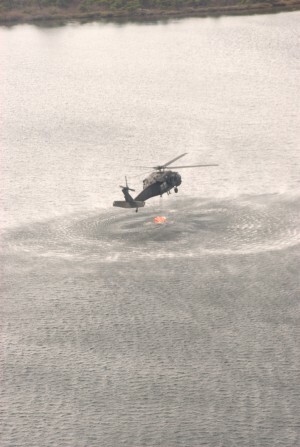 Rodda flew water bucket missions in the area in April, 2008, when wildfires threatened the Minnewaska State Park in Ulster County and used that experience to help train the National Guard aircrews and help support this year’s water bucket drops. “Crews have to deal with the demands of that water bucket slung underneath the aircraft, the smoke and heat of the fire, communications with other ground and air assets and then putting their drop where it can do the most good for firefighters,” Rodda explained. The experience was demanding and rewarding, said Chief Warrant Officer 2 Louis Malizia from the National Guard’s 3rd Battalion, 142nd Aviation Regiment.